A fused being, she is half Shakuyaku (human), and Kagan (golem). When they both came to terms with each other, they started calling themselves Shakugan. Shakugan often looks like a human, but she can change her limbs to huge rock pillars at will. She was a country girl that lived in poverty with her family, until she was discovered to have hidden powers and was thus sold by her parents to the monastery. She was subject to experimental merging of a human and a demon, but the process went haywire and she lost control and any physical traces of humanity, escaping and killing people while in a daze. Jinka's group managed to return Shakuyaku to her human self, but she was saddened for her actions. 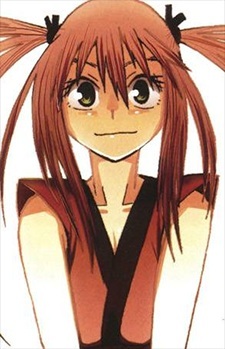 She got close to Shinsuke and accepted her current circumstances as fact, and became cheerful again. Kagan also recovered its conciousness and befriended the group, sharing bodies with Shakuyaku. While battling the Bagman in Kagan's mountainhome, she stops a huge boulder from crushing a small cabin where a young mother was delivering twins. She succeeded, but was completely drained and afterwards became a lifeless rock to recover her energy. It was stated that she may sleep for even a thousand years before recovering. Her sacrifice completely changed Shinsuke from a cheerful coward to a gloomy swordsman bent on revenge. In homage, the newborn twins were named Shakuyaku and Kagan.